Beginning in 1930, Sears began heavily promoting their custom home design and construction services. Rather than using the Sears standard house plans, the customer could create a custom plan. According to the Modern Homes catalog: "If you have been unable to select a design from our Modern Home Catalog that meets your requirements, you should not fail to take advantage of this special plan service, our experienced organization and low prices on high quality material." These custom Sears houses are nearly impossible to identify since they are one-of-a-kind. I recently saw a house in Glenview that vaguely resembled a custom Sears house I had seen featured in the 1938 Modern Homes catalog. The actual house was built in Merchantville, NJ. 1044 Golfview Road, Glenview. The houses really aren't that similar (and the Glenview house is much larger), but I wondered if the same architect designed both. To me, this house had the "Sears look". Intrigued, I searched the Chicago Tribune archives for the address. I found a 1936 article that stated the owner of the house was General William H. Rose. Rose was the General Supervisor of the Sears Modern Homes Department. I knew this house was a Sears custom house; now I just needed some proof. Fortunately, the current homeowner had the scoop. She already knew that the house was built by Sears. And she had a copy of the original blueprints! The blueprints clearly state that the client was General and Mrs. W.H. Rose, and that the plans were from the Home Construction Division of Sears, Roebuck & Co. The date is 11/13/1933. Photo courtesy of Jurdis Walton. On the blueprints, there is a "Drawn By" field and the initials "BTL". I believe these initials stand for B.T. Lourim, an architect who was working for Sears at the time. I wonder how many people already know their houses are Sears houses but have never mentioned it. East side of the General W.H. Rose house. Photo courtesy of Nina Yoo. This house was built in 1934, and originally sat on 2.25 acres. The house is largely original. According to the homeowner, only the kitchen was expanded and a bathroom added to one of the bedrooms. The interior walls are made of plywood. This was not typical of Sears houses, although plywood was gaining popularity in the 1930's so maybe the Roses wanted to jump on that trend. William H. Rose retired from the Army in 1919 with rank of Brigadier General. He was one of the engineers who worked on the Panama Canal, and a couple of his children were born in Panama. General Robert E. Wood, who led Sears, Roebuck for many years, served with Rose in World War I. Wood joined Sears in 1924 and Rose joined sometime after. By 1930 Rose was working for Sears and his family was living in Chicago. The Roses moved to Bradenton, Florida in 1940 and General Rose became the special assistant to the Deputy Chief of Engineers, U.S. Army. 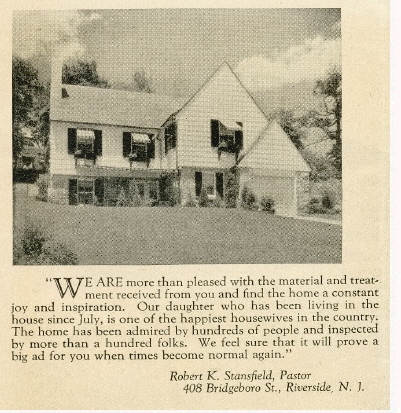 By 1943, Edward P. Byrnes and his family were living the house. He was the owner of a trucking business--North Shore and Central Illinois Freight. He also was a member of the Glenview village board in the mid-1960's. Mrs. Byrnes served as a trustee for the Glenview Public Library. The current homeowners bought the house in 1986 from the Byrnes family. This may explain the odd discovery of plywood walls in this home. I was just reading - having just received it in today's mail - a book called "Houses By Mail - A Guide to Houses from Sears, Roebuck and Company" by Katherine Cole Stevenson and H. Ward Jandl. On page 22, there is a brief discussion of the dilemma Sears was in during the early years of the Depression, and how they tried to keep their hand in, after bowing out at first in 1934, when they had liquidated over $11,000,000 in mortgages and dropping the Honor Built Homes division. I quote - "...in 1935 Sears reentered the housing business, this time selling only houses (not lots or financing), fabricated especially by General Houses, Inc., of Chicago. This arrangement resulted in a new line of 30 prefabricated houses with steel framing members, steel roofs and plywood walls." I realize the blueprints are dated November, 18, 1933, but as reported by the 1934 annual report by Sears, saying "About $11,000,000 in mortgages were liquidated during the year, and the Modern Homes Department was discontinued", it's possible that the time frame can include their association with the General Houses division beginning in 1935, and they got their housing materials from them. It also states their association had likely ended before the 1940 (and last) catalog was issued. I'm not sure if the steel framing members and roof girders and rafters were the only form of material available in custom houses from them at the time, but it'd be an interesting investigation to find out if they are steel or wood! Hi, Shari! I unearthed some information this year and learned that all the information in "Houses by Mail" about General Houses was incorrect. If you search my blog for General Houses or prefabricated, you can read the TRUE story. Sears had no affiliation with GH in 1933. Perhaps they used the Wood house as an experiment to see whether plywood would be a more affordable material. Sears never got material from GH-- I have no idea where Ward and Jandl got that idea. GH bought their materials from outside suppliers. I had the same reaction when I heard plywood walls but I seriously doubt that GH was involved in any capacity. Well, don't I feel silly! You know, when I read that, I was somewhat skeptical, having never heard anything about that association before in any other sources I have seen so far, which have been considerable. But, I'm not "an expert" you know? LOL I haven't written books about it, or done years and years of such extensive research about this subject, but I have noticed several obvious errors in this book (transposed photos, text editing errors misidentifying a feature or a location, for instance,)as well as some in other books by those who have done so. Guess nobody is perfect, but it seems if you're going to write definitive books on a subject, and do years worth of research, some fact checking, and some basic editing by your publisher would be in order? That's my idea anyway. Thanks for your kind reply, and please excuse the error! Loving your site though! I love sites on this subject, and I have been reading up on this subject, relying on others' research of course, for several years now. I've got a huge bookshelf full of books, and multiple websites marked and researched online. I've also done a good bit of local touring, looking around for examples of this home type. Since I live in Central Indiana, in the midst of the Great Midwest, I've been hoping to come across some. I may have before, and I've got my suspicions about some I've seen, but haven't been able to verify anything yet. I've also always had a fascination with the basic bungalow type architecture that seems to be a large portion of their business. But I read everything I can find about all of their homes, and can't help but imagine what it might have been like to live in one of these marvelous homes when they were first new. I will continue to investigate your website - it's my latest discovery online, and I intend to spend as much time as it takes to go all through it! Your site has answered a question I have had for many years concerning customized Sears home to meet the buyers design requirements. I grew up in a Sears home my dad constructed in about 1923 in Plymouth, MI. It was manufactured for Sears by Bay City Homes of Bay City, MI and roughly resembles the smaller Hathaway Model. It was a two story with three bedrooms and a bath upstairs and living room, dining room, kitchen with breakfast nook and a sunroom with front entrance on the first floor. there was also a full basement. They first built a two car garage in which to live in while the house was being constructed. My dad owned a dairy business and when the depression hit in the late 1920s he had problems collecting milk bills from his customers, money became tight and they were forced to rent the house for several years. They finally were able to move into their new house in 1936. The house was built of very good quality materials with solid oak flooring, woodwork and stairway to the second floor. The oak was so hard you had to drill an hole in it to drive and nail or screw. They home was sold in 1978 after my mothers passing, and it is in excellent condition today. I'm in Novi, Michigan and would like to get a photo of the house in Plymouth. Can you point me to the address for the house?